We awoke at eight to blue skies with white fluffy clouds, not the rain we were originally forecasted. Hurrah! Before we went down to breakfast I received an email from Booking.com, the website that I used to book most of our hotels. 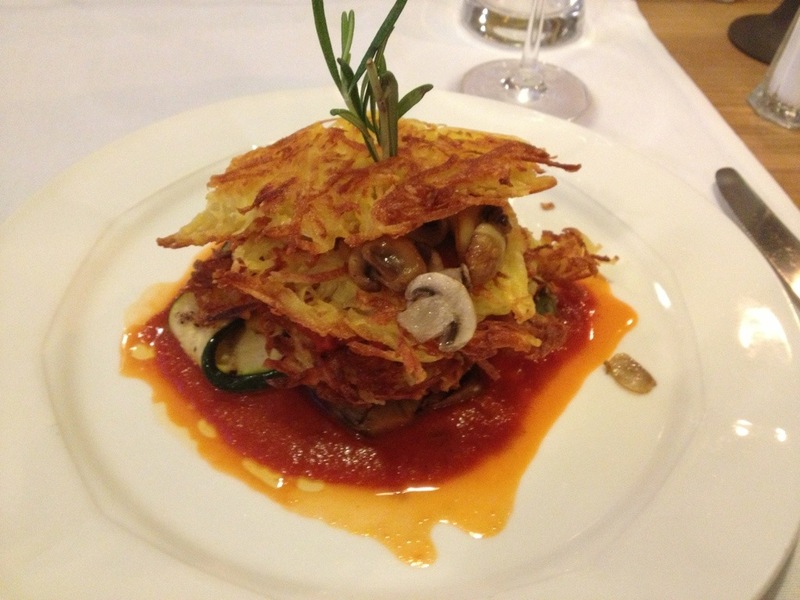 As usual they were asking me to review a hotel we had stayed at (Hotel Christine in Füssen). 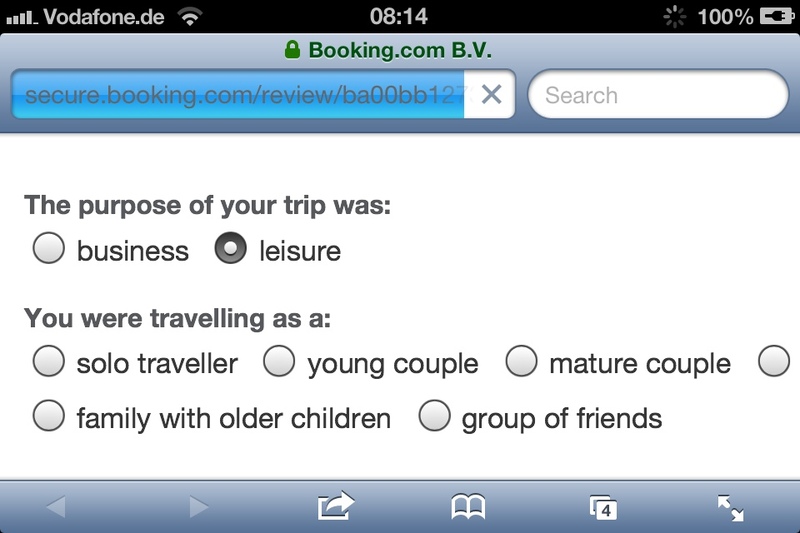 However, I wasn’t sure exactly what category I fitted into. We had a hearty breakfast as usual, although James was slightly foxed by the hot water dispenser for the tea dispensing stone cold water. You had to ask the lady for hot water but the urn was out as usual so it wasn’t exactly obvious! After breakfast we had a short rest for our food to go down. James was feeling a bit tired so we hung around a bit longer for him to get his energy up. James has been using Nuun tablets for an energy drink on this tour and we have noticed something rather unusual about them. 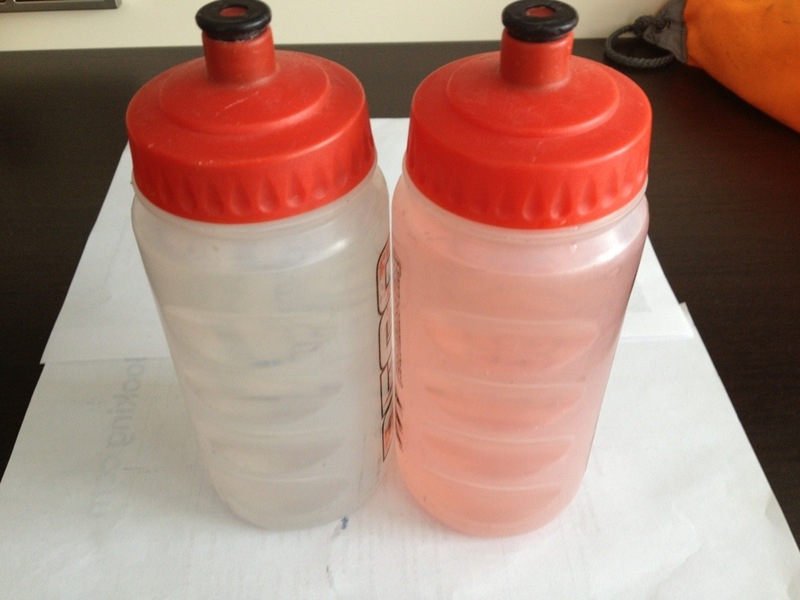 Here’s what they look like when initially made up (the one on the right has the Nuun tablet, the one on the left is just plain water). 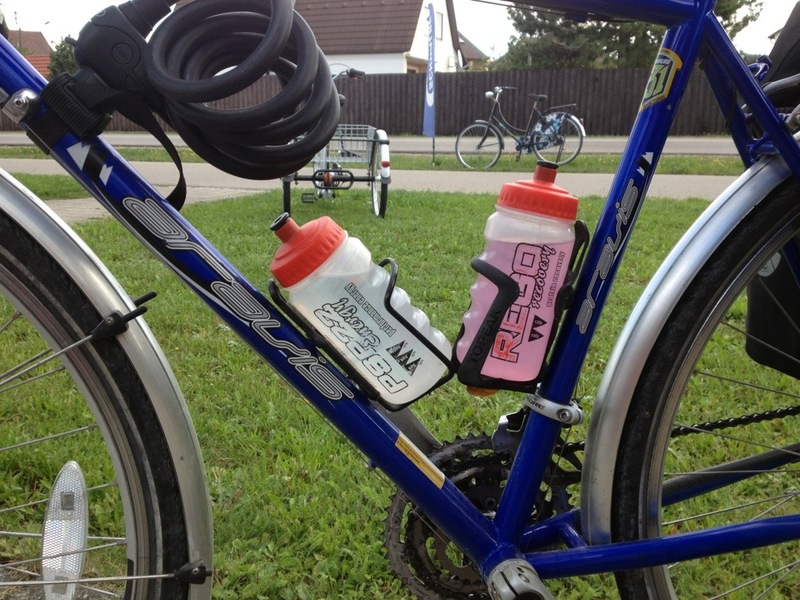 Here’s what they look like on the bike when we set off. 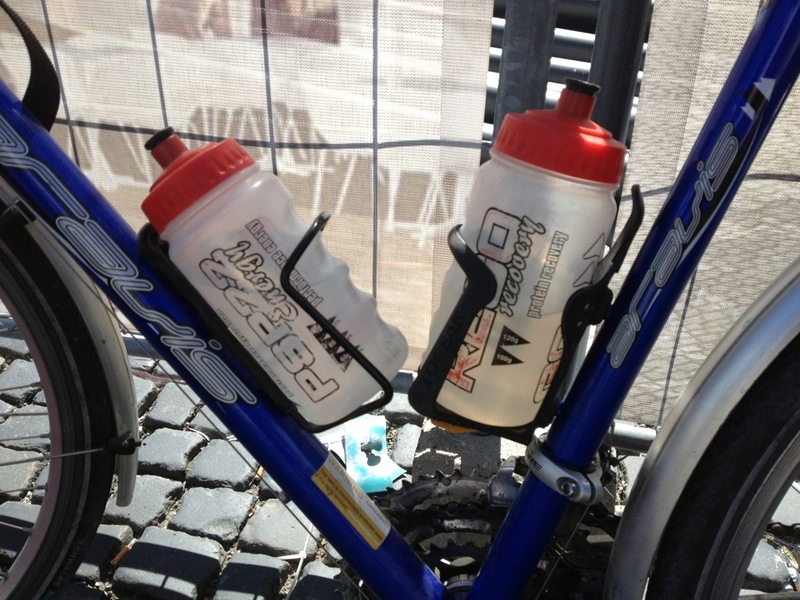 And here we are at lunchtime – the Nuun bottle has gone almost clear in colour. It’s done this every day, it’s a kind of magic trick! After a good hour back in the hotel room we felt ready to go so we packed up our stuff and checked out. Here is our planned route for the day. 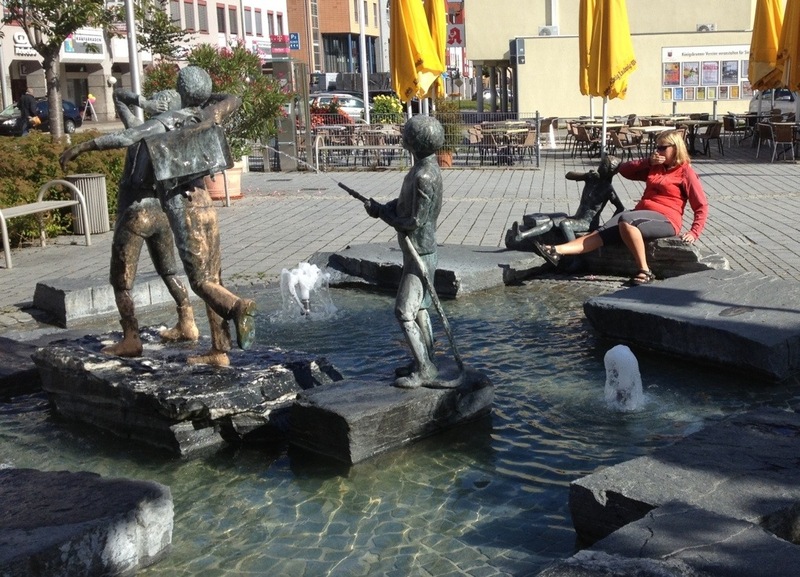 The weird baby sculptures weren’t the only bits of artwork outside our hotel – there was also a fountain. I decided to make myself part of the sculpture! Here I am sitting beside a young girl, copying her position! 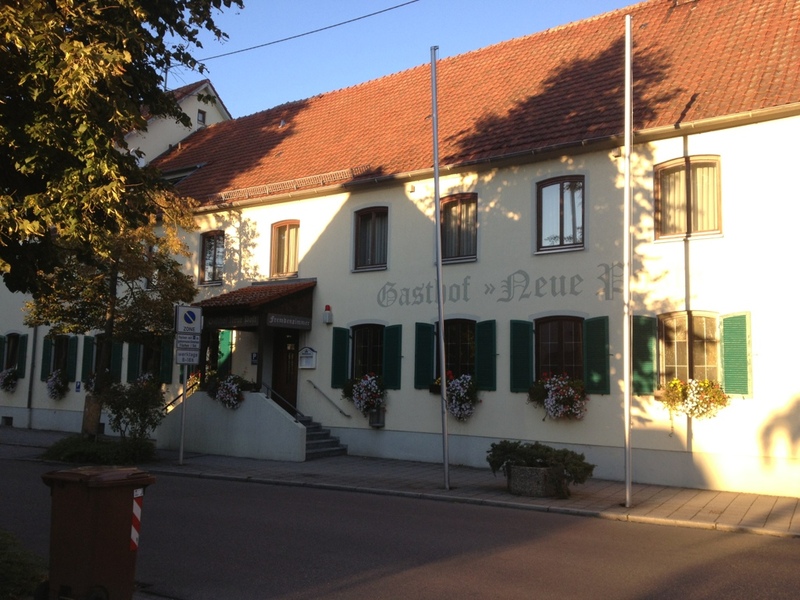 Here we are outside the Besthotel Zeller, ready to head off. We liked this hotel! We had diverted from the official route to get to Königsbrunn and so would need to retrace our route about a mile to get back to the official path. 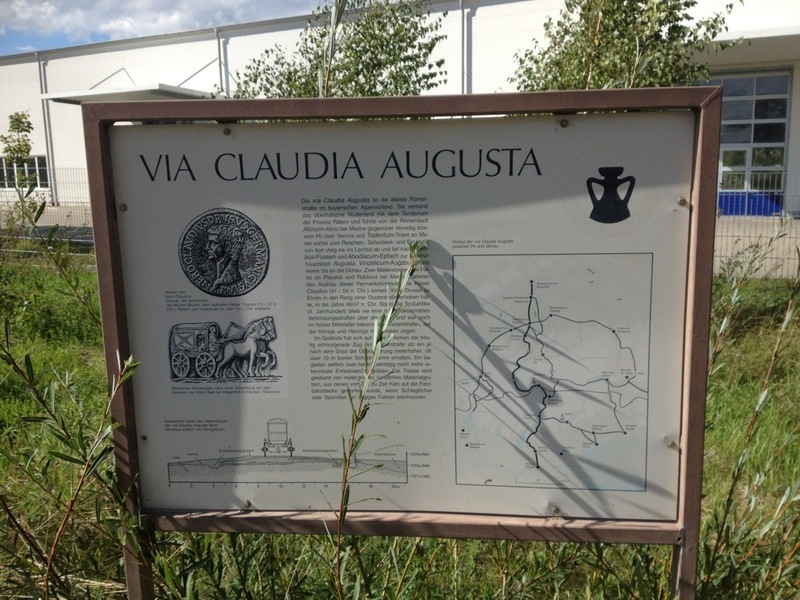 However, several months ago I had spotted an amusingly-named town just off route and thought that we really ought to visit there. We could do an easy detour and then rejoin the route later, so that’s what we did. We returned to the Mandichosee which we cycled past yesterday but didn’t see (it was behind an embankment). 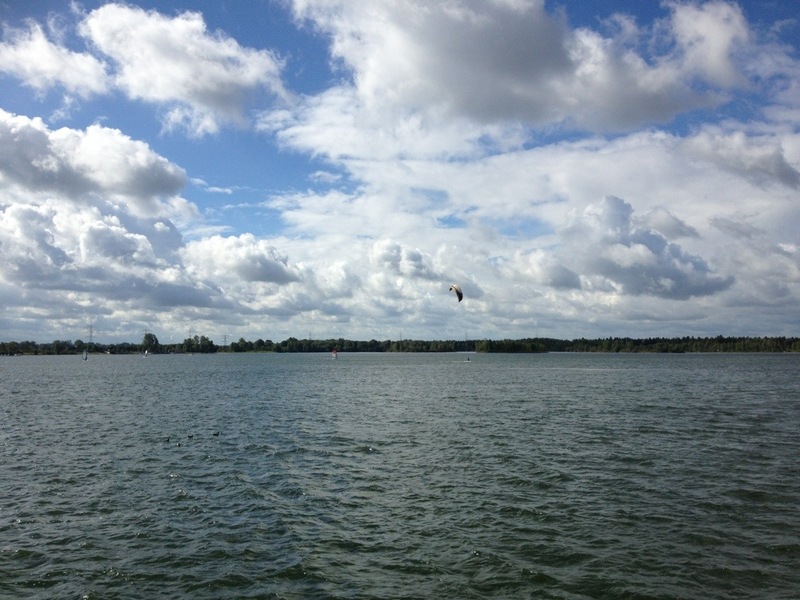 This time we climbed up the bund to have a look and saw a rather lovely lake with windsurfers and kite surfers. 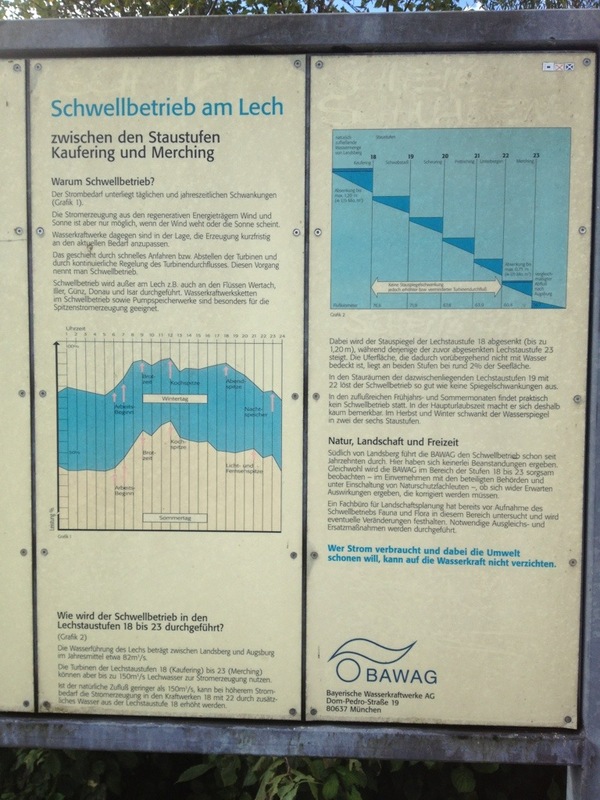 There was also a very handy information board which told us about all the different hydroelectric schemes along this section of the river. Lots of interesting information here about peak usage times etc. 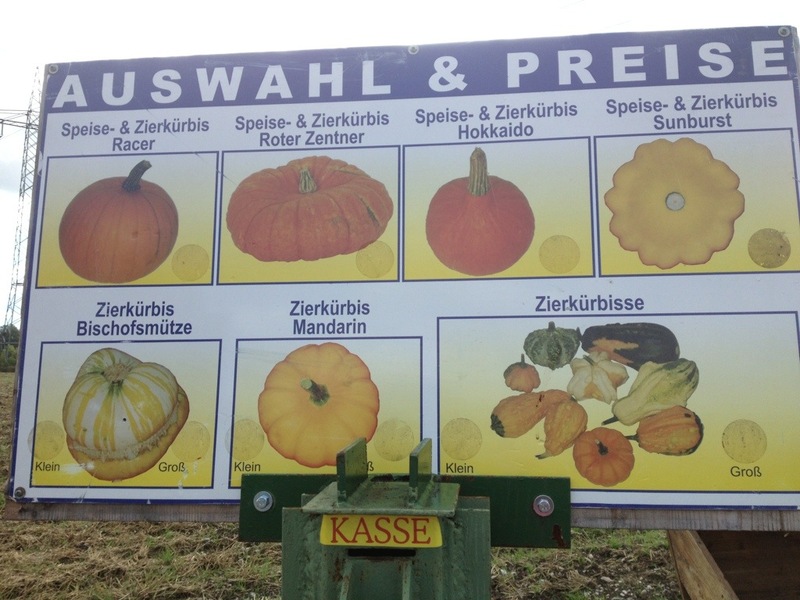 We now ignored the signage for the Romantische Straße and headed off to Mering, passing this impressive roadside stall with lots of squashes/pumpkins. Here’s the choice. 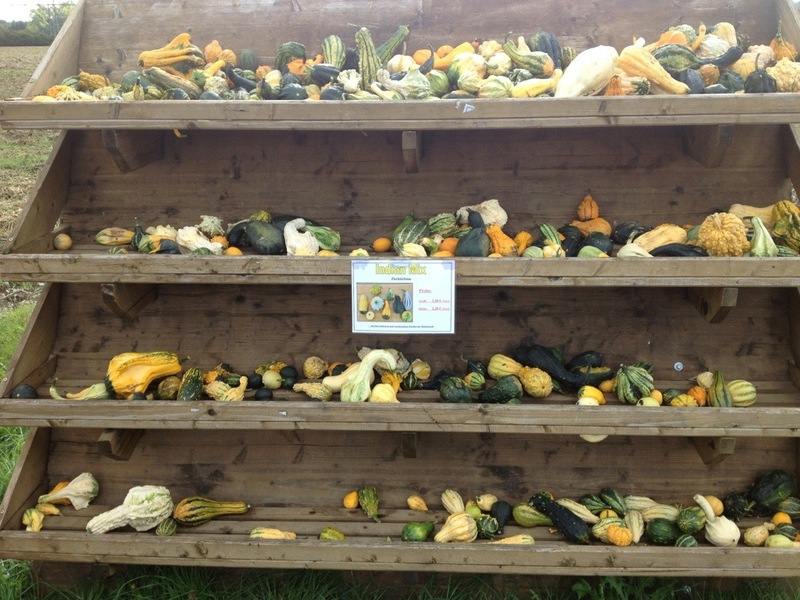 7 Euros for a large pumpkin, for example. 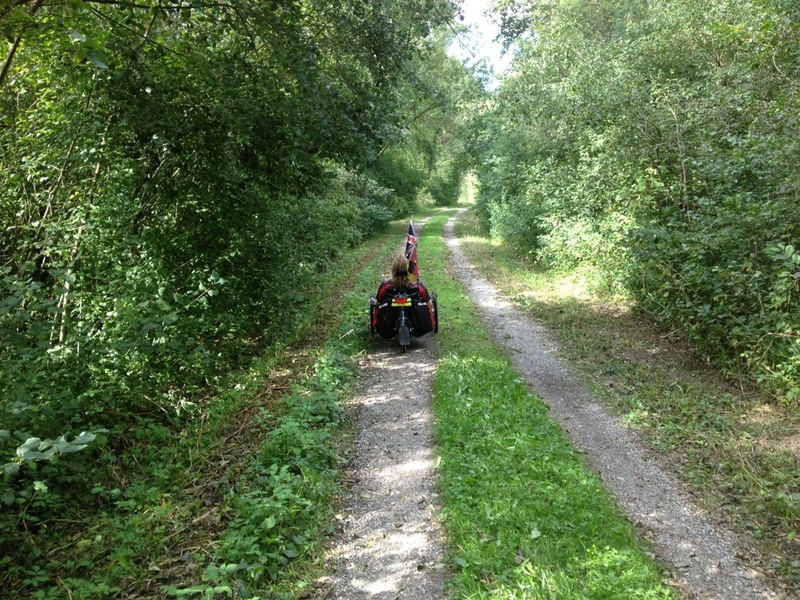 We had to do a bit of complicated navigation in Mering to cross under the railway line and road and it got a bit confusing but we soon found ourself on the cycle path beside the B2 at Sankt Afra heading northwards. 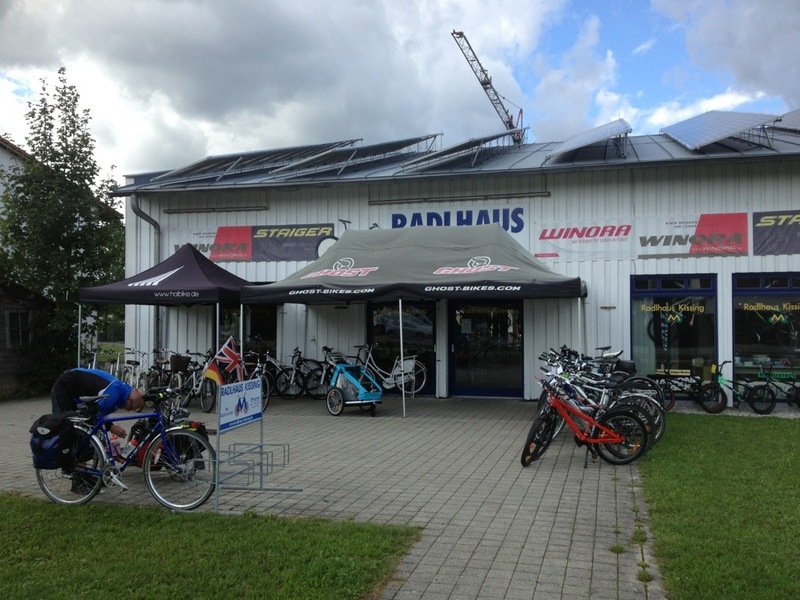 Then, most fortunately, we found ourselves passing a bike shop! I’d been looking for one for two days as my bicycle bell had broken on the train journey. This was a large bike shop and they had plenty of choice of bells. 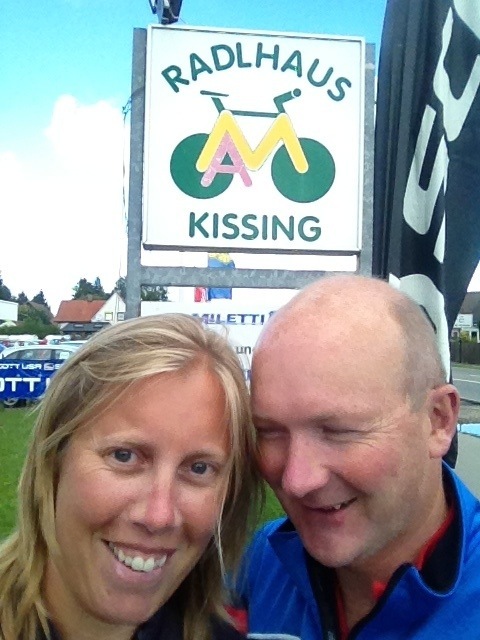 Here we are outside the amusingly-named bike shop. And here is my new bell. 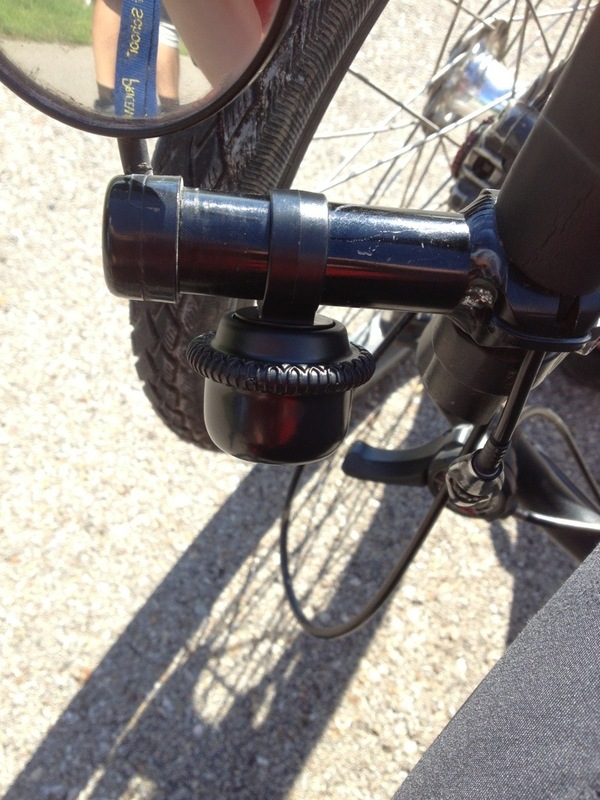 Rather than having a thumb hammer thingie that you ping (and that always breaks off for me as my bell has to be mounted upside down and is on the sticking-out bar end) this one has a round collar which you twist – this is easy for me to do whilst still keeping my hand on the handlebar. And it makes a loud enough noise to warn people I am approaching. 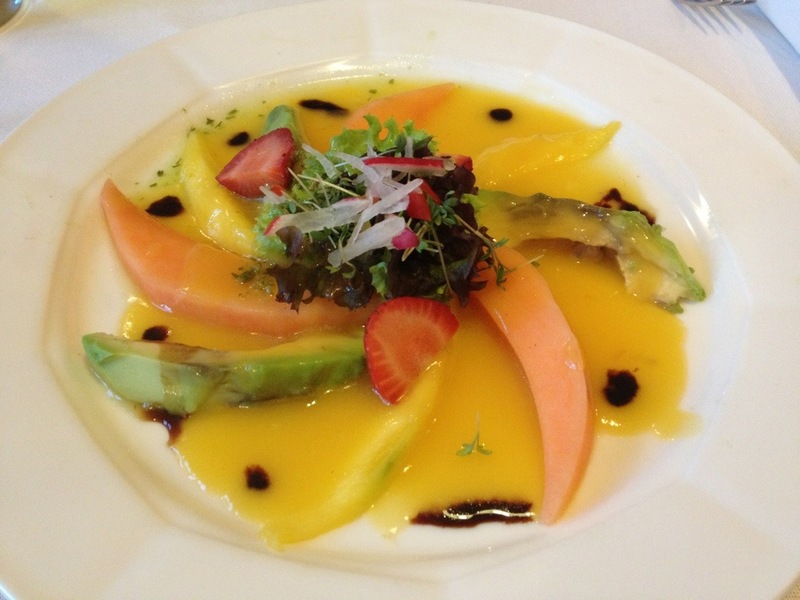 Good value for 3 Euros. 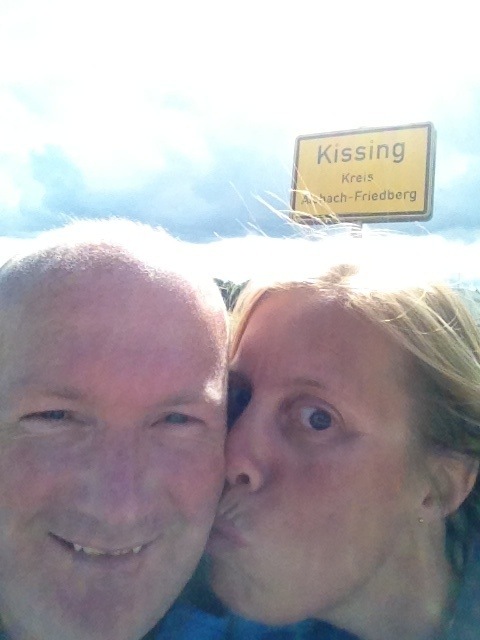 On the way out of Kissing we found a road sign and just had to try another self-portrait. We’re not too good at these though! 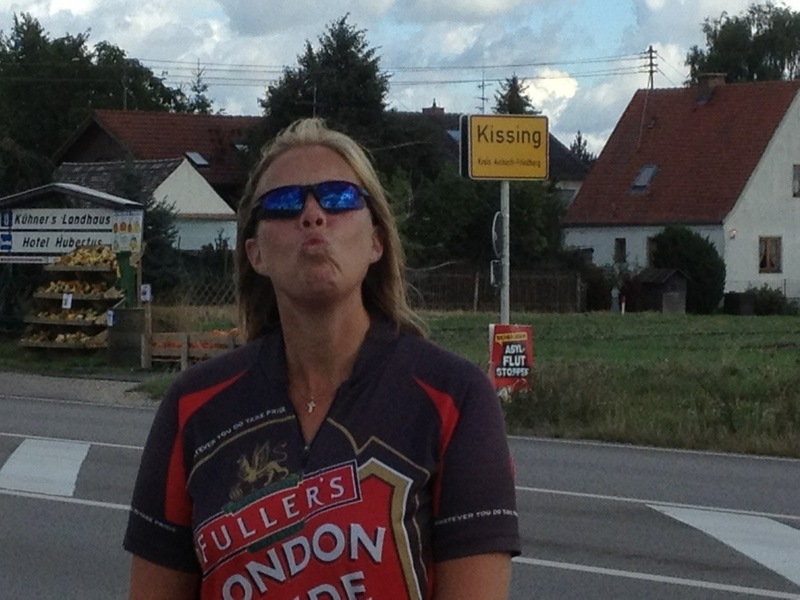 Well it is the Romantic Road! After all that nonsense it was time to get pedalling and stop mucking around so much! 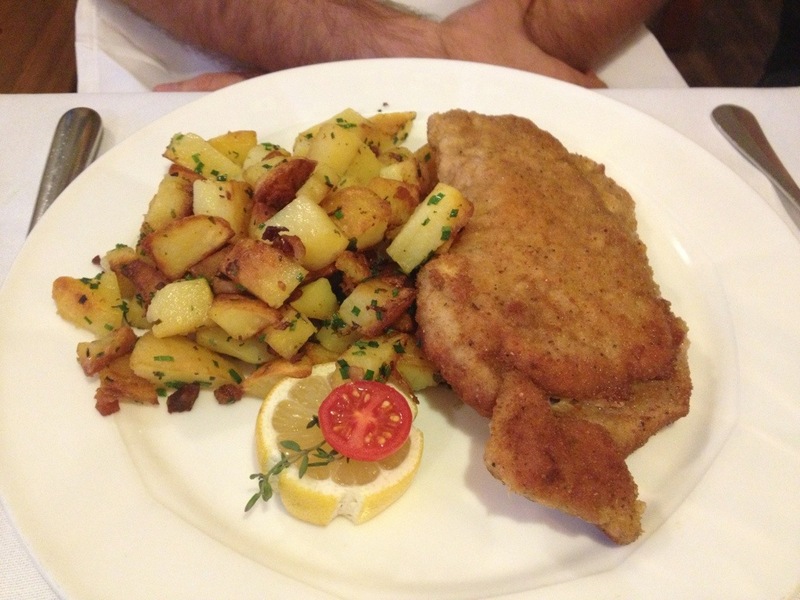 We had the option of going directly to Augsburg or doing the recommended detour to Friedberg. 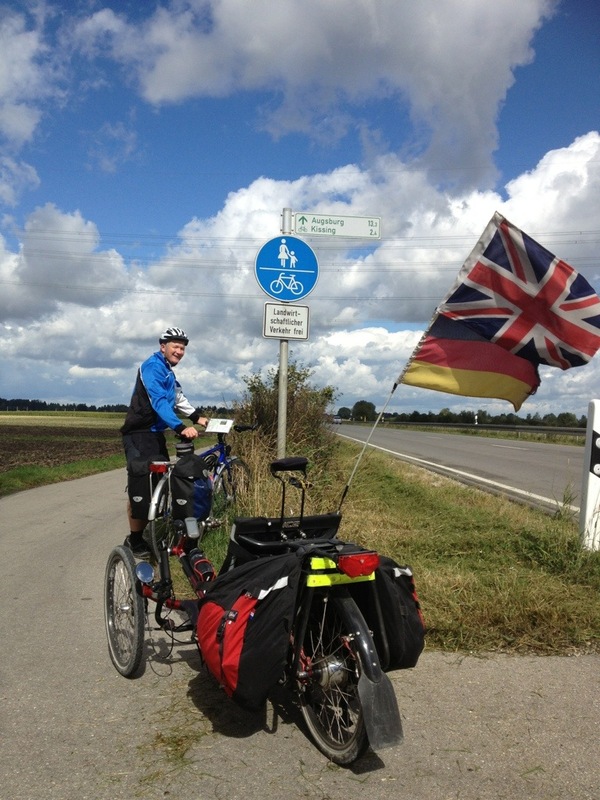 We were enjoying the ride so decided to do the Friedberg option which did involve a bit of a hill. We passed a field where it looked as though the police were training the dogs with an obstacle course and then found ourselves about to head up a bit of a hill. 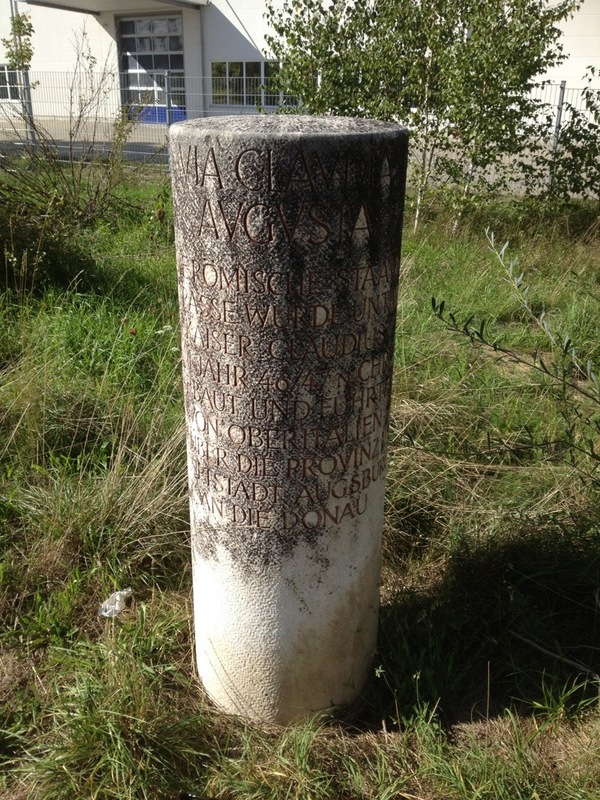 This impressive series of signs on one post showed the various options around here. We had a short climb up a hill and then rode through some woodland. There were lots of children playing in the woods, presumably some kind of holiday club, and several of them peered at me with amazement as I trundled past. I suppose there aren’t that many recumbents around really (we saw one yesterday but that was it) so it was probably a new experience for them! 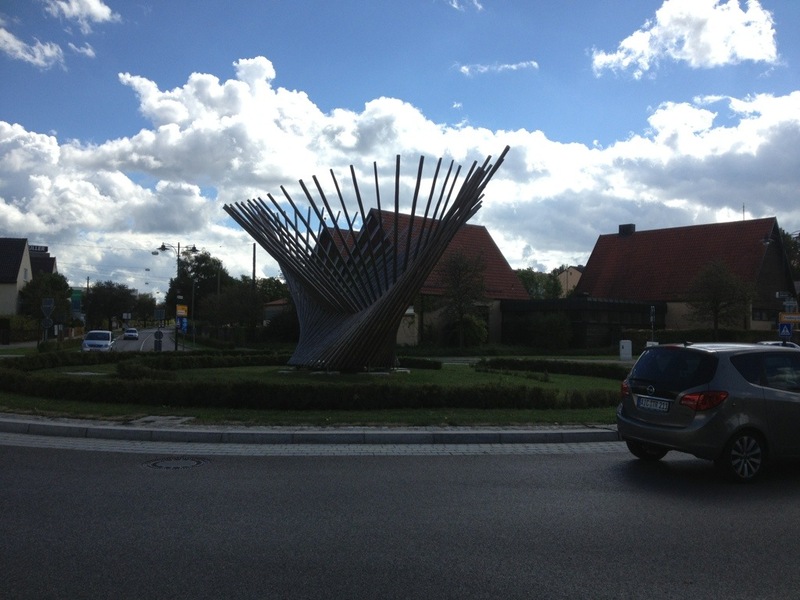 At a roundabout at the top of the hill in Friedberg we saw this sculpture. 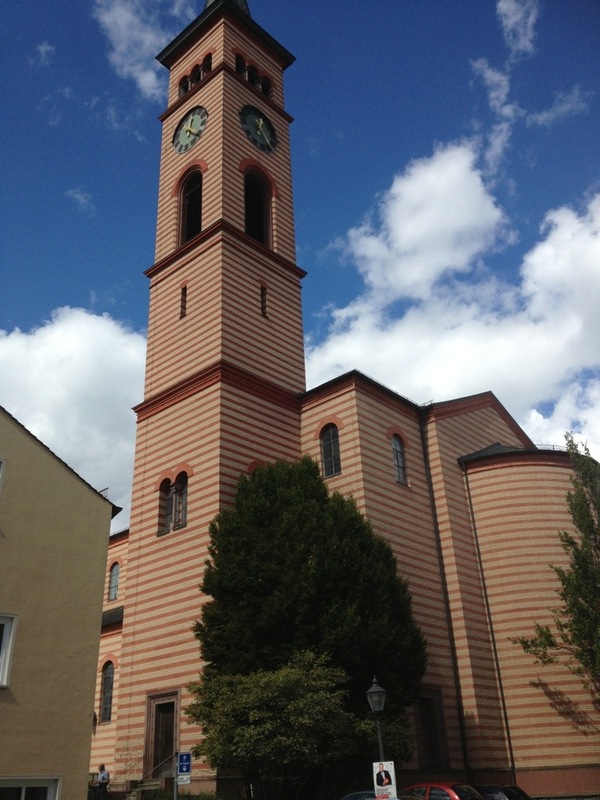 We entered the central part of Friedberg and came across this fantastic stripy church. 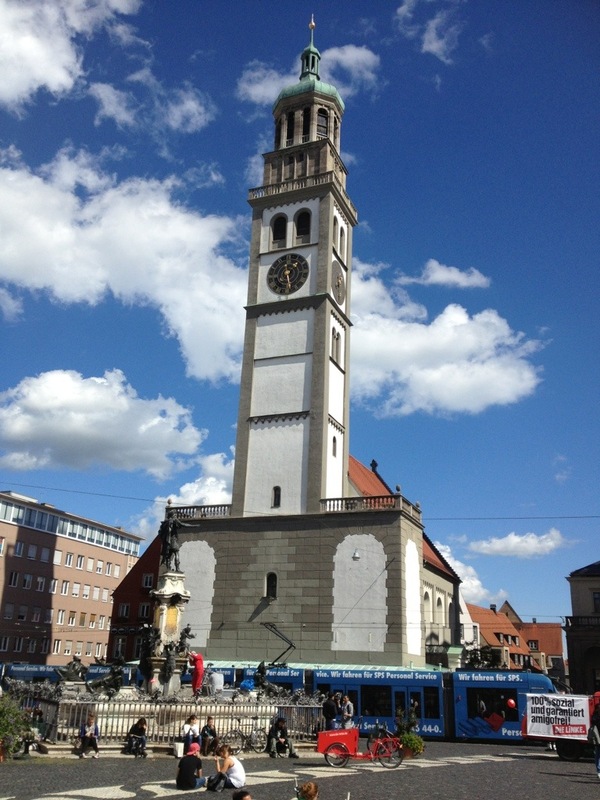 The Stadtkirche St Jakob (Town Church of St James)… whose 56 metre high belfry is the most prominent feature of Friedberg’s skyline, for all that its Italianate form makes it an unusual, not to say incongruous, main landmark for a German mediaeval town. 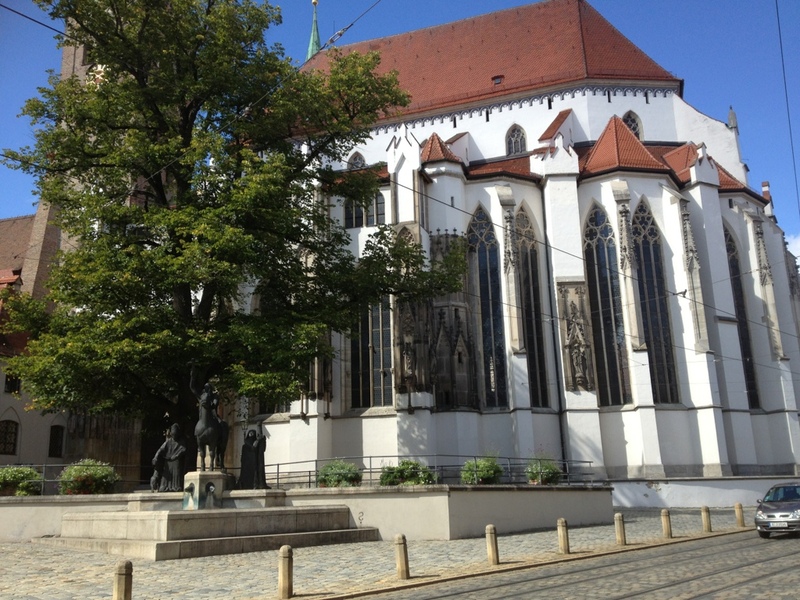 The Gothic church which formerly occupied the spot was gravely damaged in 1868 when the tower collapsed. 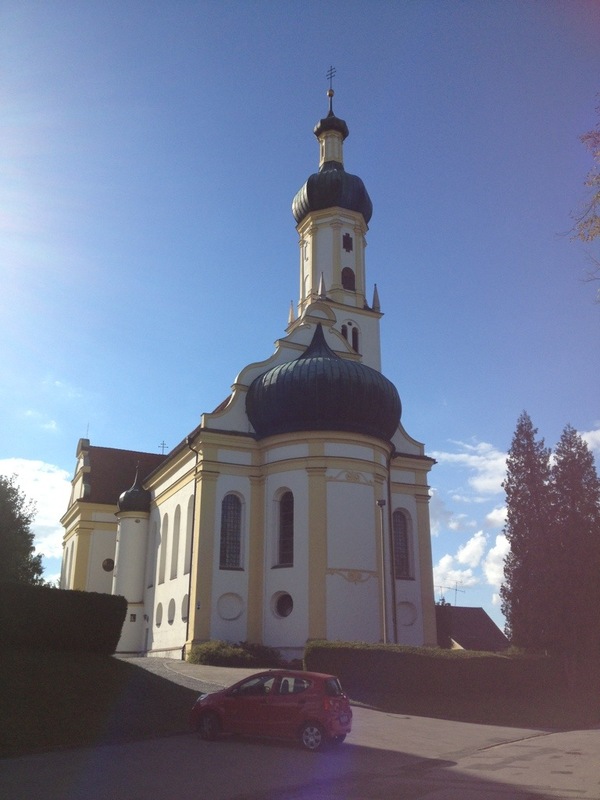 Partly on grounds of cost, and partly in line with the artistic tastes then current in the Kingdom of Bavaria, it was decided to replace this with a new building based on the architectural principles of the early Christians. Thus the interior was modelled on the basilica of San Apollinare in Classe outside Ravenna, though it was the great Romanesque church of San Zeno in Verona which provided the inspiration for the exterior. 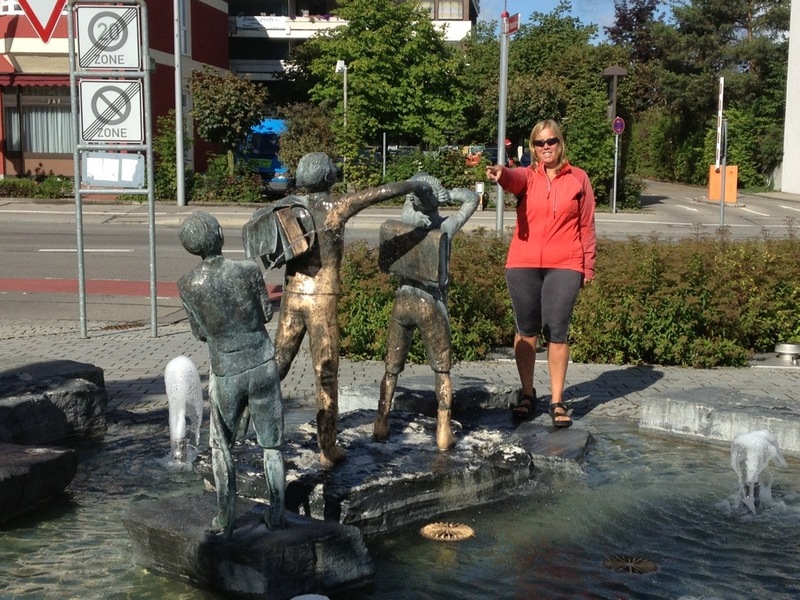 A downhill whizz from Friedberg led us to Hochzell and then a short section on a gravel track before we crossed the bridge over the Lech and headed for the centre of Augsburg, taking a route through the industrial estate. 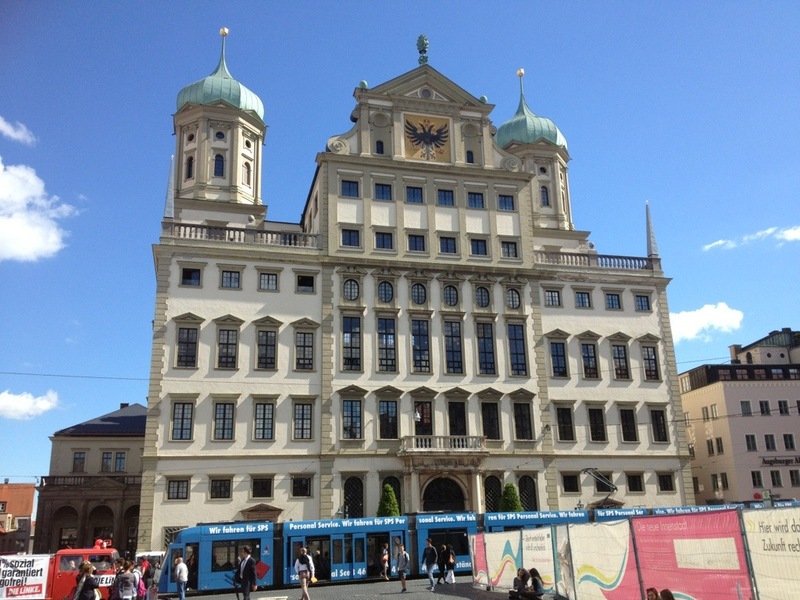 We saw various roads and buildings named after the Fugger family who were very important in Augsburg’s history, as were the Welser family who at one point owned the whole of Venezuela! 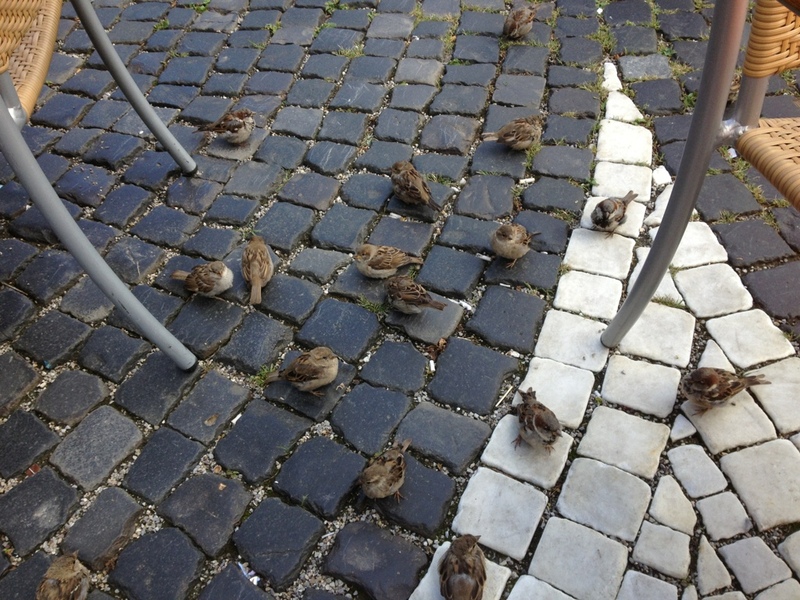 I had Gulaschsuppe and shared some of my roll with some very tame sparrows. 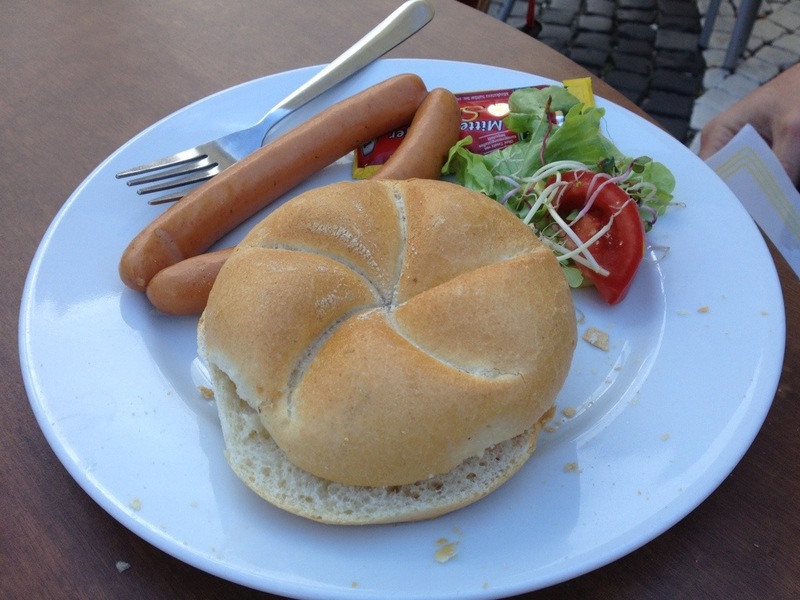 James had Wurst and bread. We didn’t linger too long but headed out along Karolinenstraße, attempting to avoid the tram tracks laced along the cobbles we had to ride. This was difficult at times for me but we managed it unscathed in the end. We were slightly surprised that the official cycle route was put on a road with the risk of tram tracks. We passed the Dom (Cathedral) on the way out. 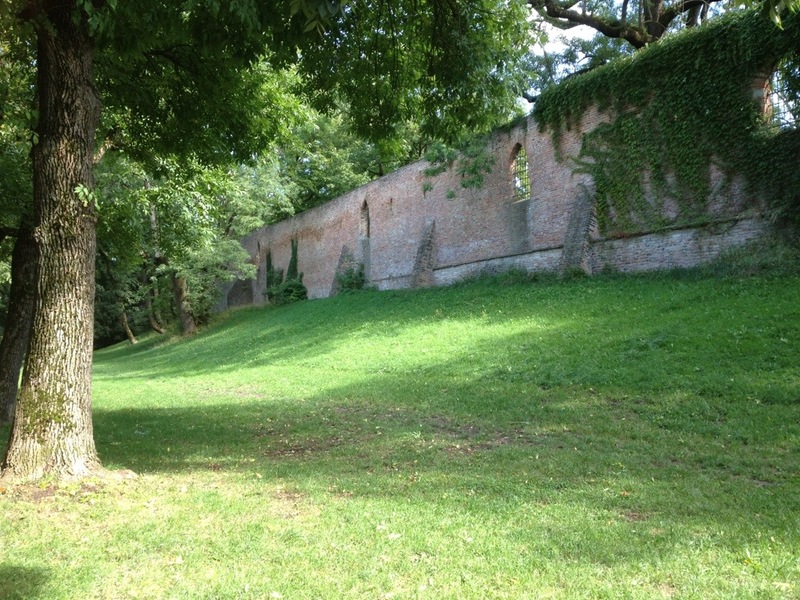 Here is part of city wall. We also went past the huge MAN factory. MAN stands for Maschinenfabrik Augsburg-Nürnberg. We then crossed over to the east side of the Lech again. We were now unfortunately on a crushed stone track rather than asphalt so it slowed me down a fair bit. On this surface I was able to ride at about an average speed of 10mph, whereas on the asphalt yesterday we were averaging 15-16mph. James found it so bumpy that he put his gloves on to give his hands more padding. 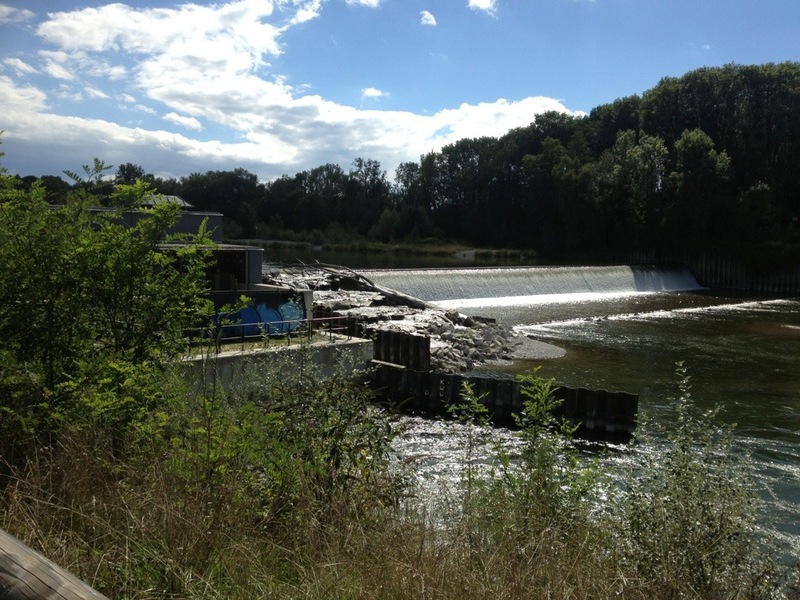 We saw yet another hydroelectric plant. 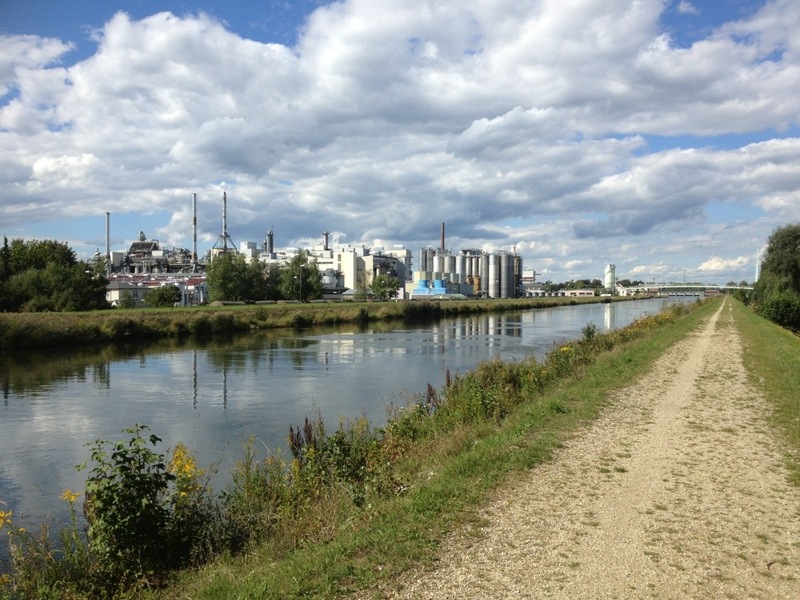 And then found ourselves approaching this enormous factory the other side of the river in Gersthofen. Here the track took a detour around a huge spoil heap and the official Romantische Straße signs disappeared. Fortunately our Bikeline book had the route, as did my Garmin, but I wonder if they have subsequently made a more direct route as we rejoined the Romantische Straße signage and saw that it seemed to be pointing a different direction from where we had come. Unfortunately we had now joined a really awful track between Gersthofen and Langwied and there was no alternative available. The track got worse, ending up as two narrow lanes with grass in the middle. This is OK for bikes but terrible for trikes and I couldn’t average more than about 6mph for the three mile section of this surface. It was lots of hard work riding for little distance reward! Finally – finally! 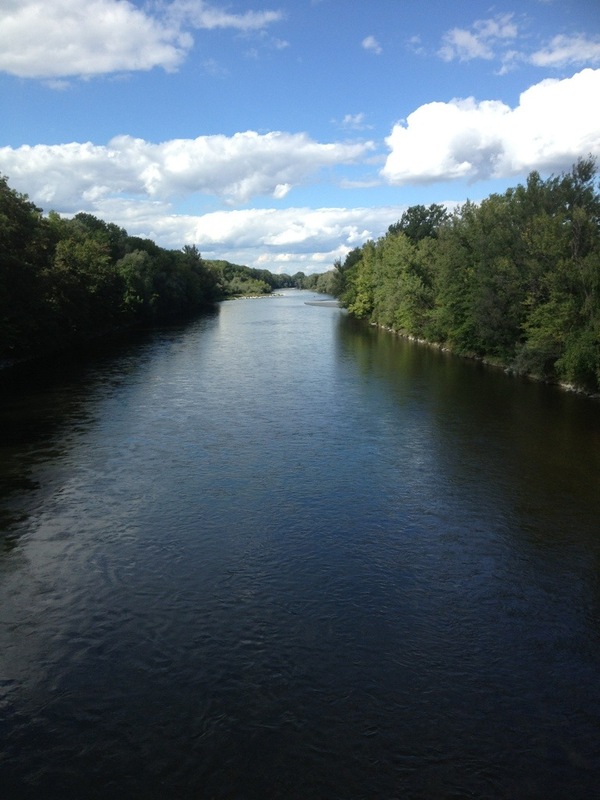 – we reached the end of this stretch at Langweid and turned westwards, crossing the Lech again. At this point we came across the Gedenkstein Via Claudia Augusta. Here’s the info board about it. We were feeling pretty pooped now, James especially, and he fancied a bit of a sit down. 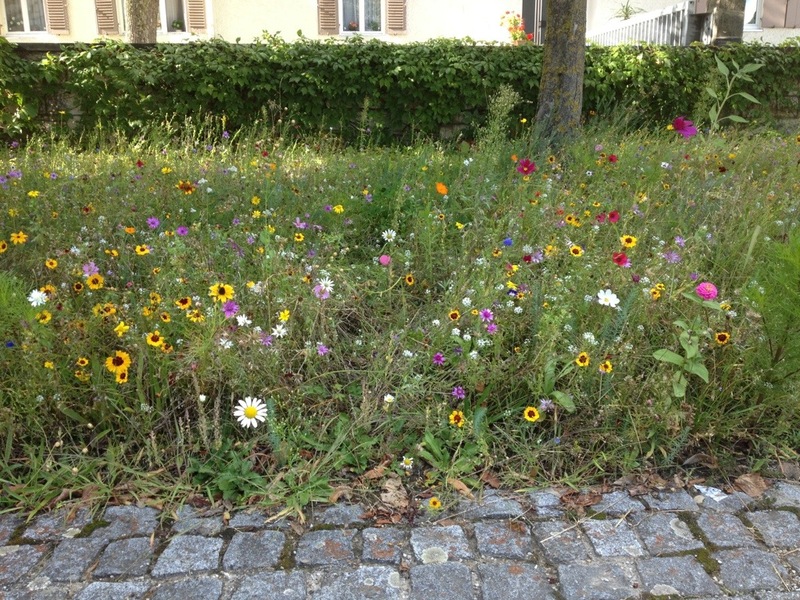 I spied some seats outside a bank so we stopped in what turned out to be a small open space with a fountain and a rather lovely wildflower border for the bees and other insects. We stopped here for fifteen minutes or so before continuing on, this time cutting a corner off the official route to save time (and avoid a hill). My chain was feeling a bit dodgy after all the riding on the grassy track – as if it had muck in it, although I couldn’t see anything. It’s a reasonably old chain but should have a bit of life left in it but it doesn’t feel quite right so I will have to have a good look at it sometime soon. 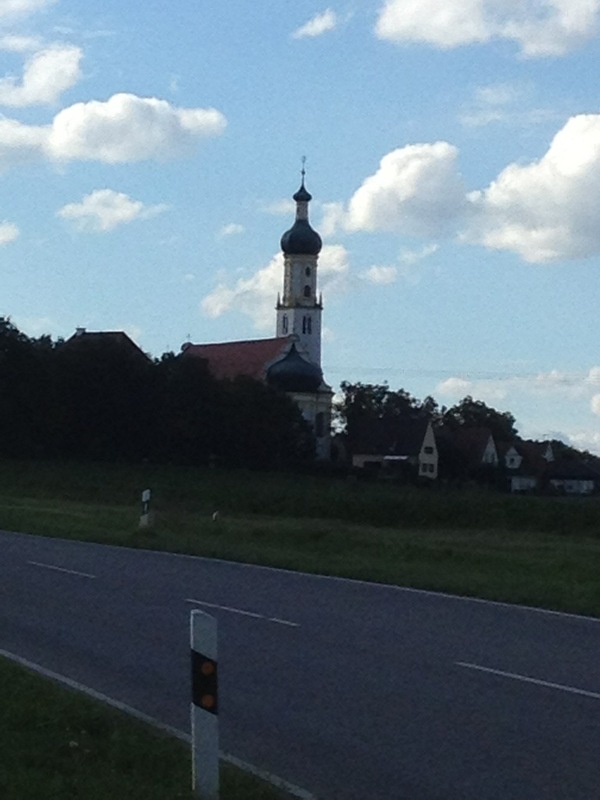 Our alternative route went straight from Langweid up the main road to Biberach, whose Wallfahrtskirche was clearly obvious on the skyline from a fair distance away. It was on a slight rise which caused my chain to make some unhappy noises! Around this time two Eurofighter planes in convoy went overhead. We’d seen a mystery fierce-looking helicopter earlier in the day, and a single Eurofighter, so there’s clearly a military airbase somewhere not too far away. We passed a runway yesterday on which James thought he could see some Hercules aircraft so perhaps they were from there, just north of Landsberg am Lech. 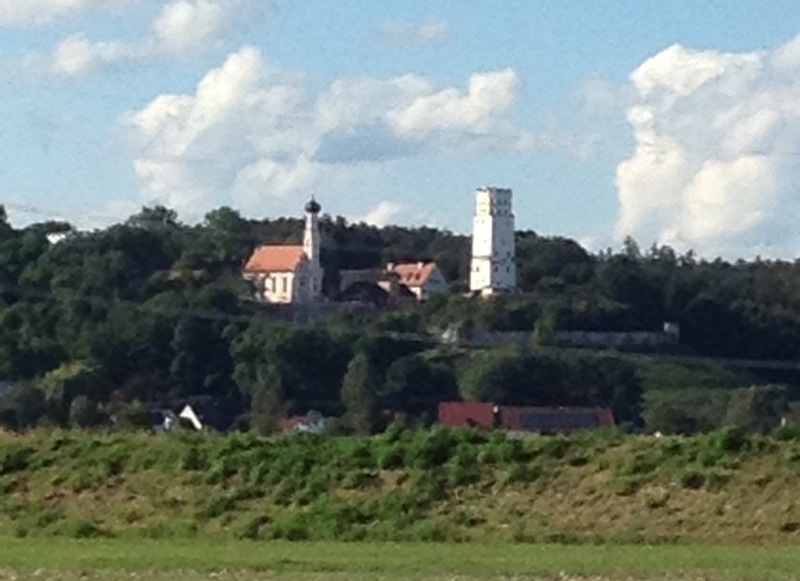 From here we could see another church and tower which we think were in the village of Markt. 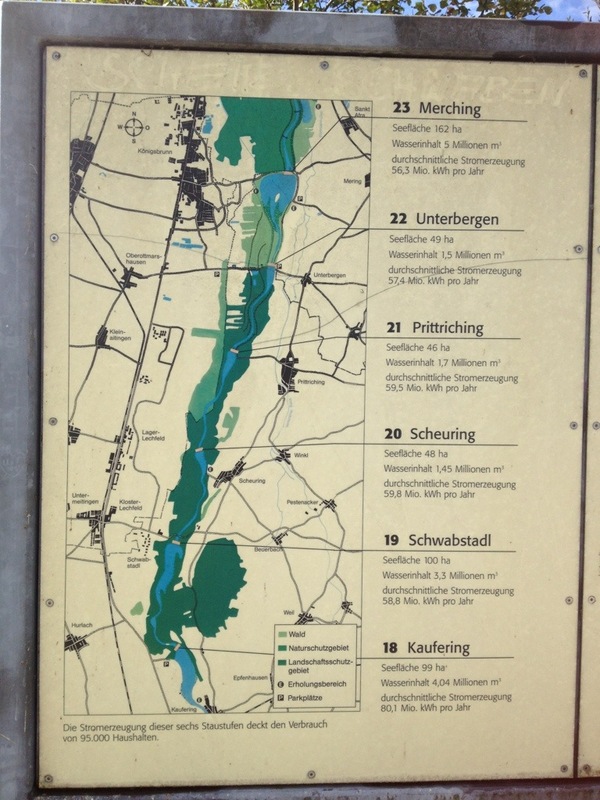 At this point we could see the quickest way to Meitingen on James’s map (which wasn’t the route I had plotted) so we sailed forth following Captain James, crossing under the B2 major road (more like a motorway) and then going over the railway in Meitingen. Our hotel looked very nice and although it was its Ruhetag (closed day) there was a chap there to give us the key and instruct us where to go. 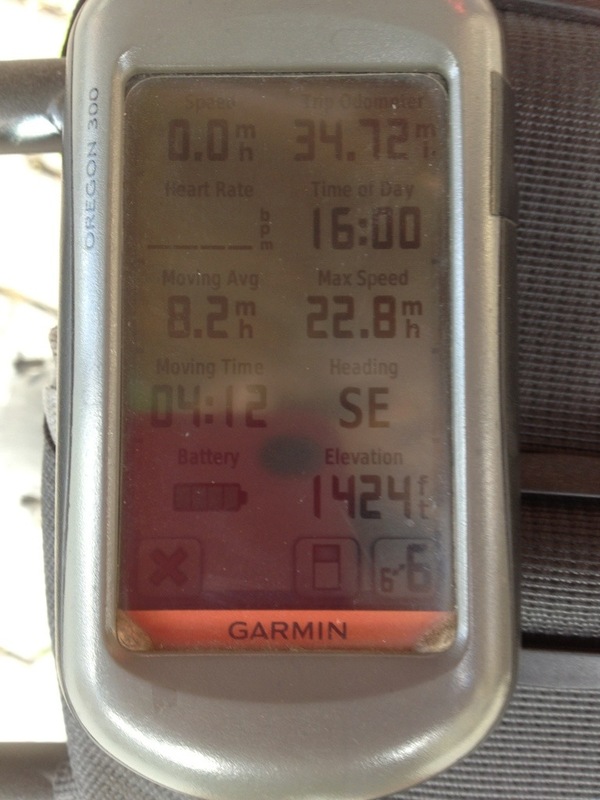 Here is the information from my Garmin today. 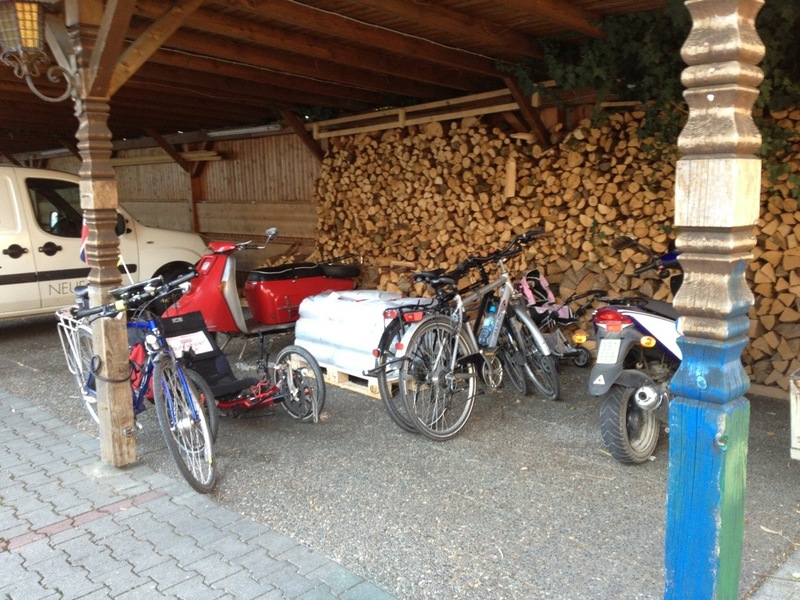 We parked our bikes under the log store. 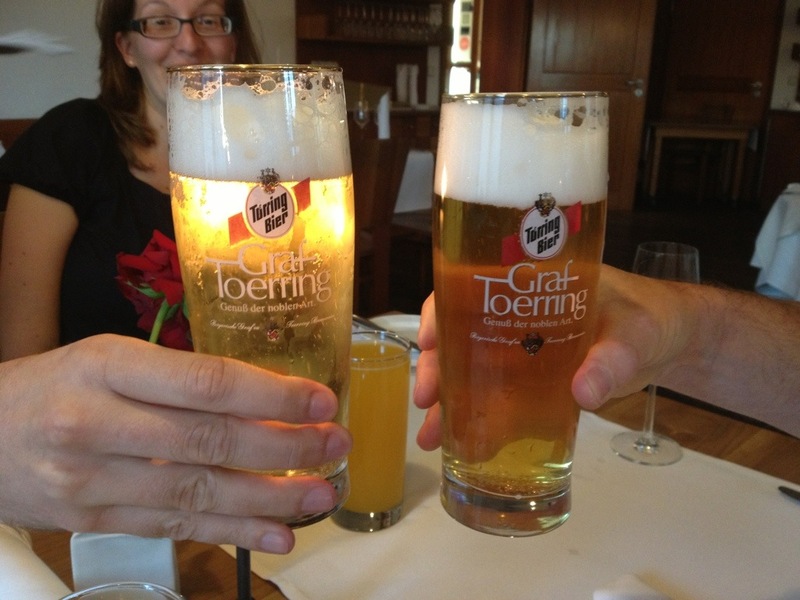 James had a bit of a sleep whilst I wrote up some of the blog and then it was time to meet Melanie and Konrad, our friends from Munich who had driven up to see another friend in Meitingen and then us. 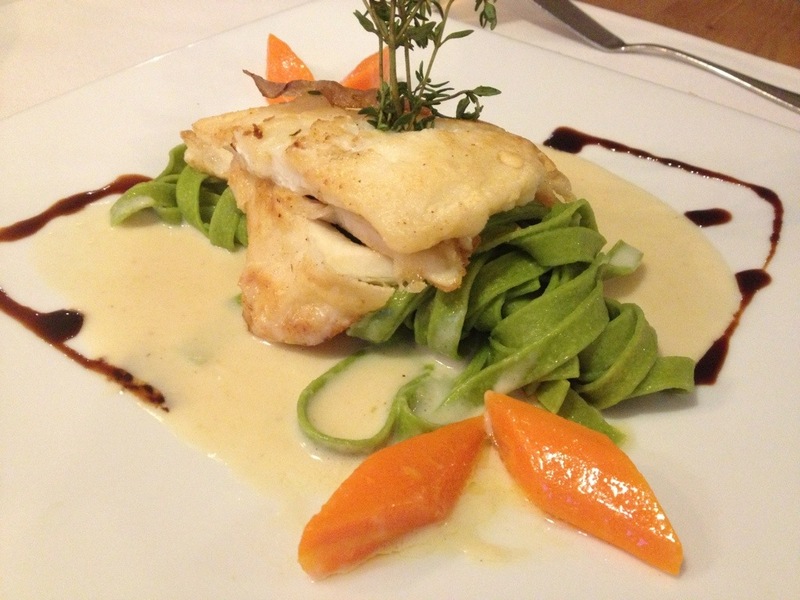 They took us to a wonderful restaurant/hotel in Thierhaupten which was a former monastery. James had a local beer. 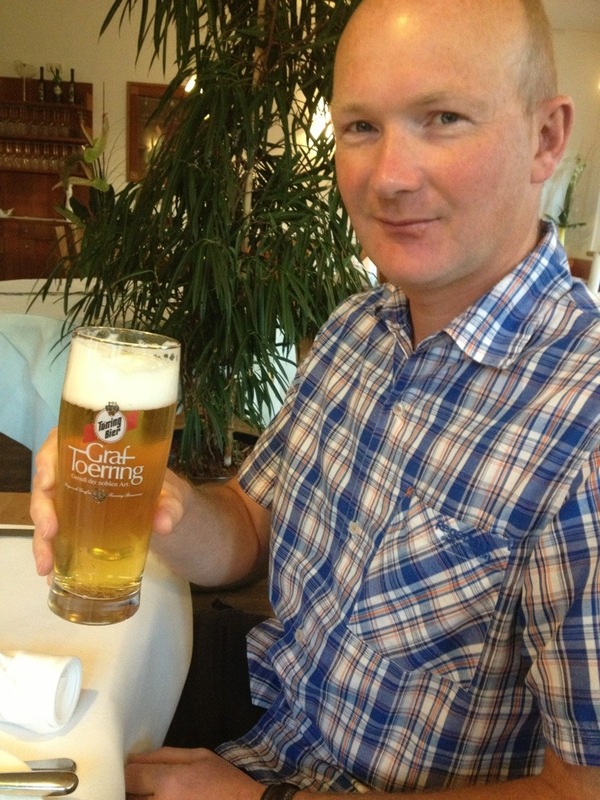 Konrad had a Radler. Well, he is a cyclist! 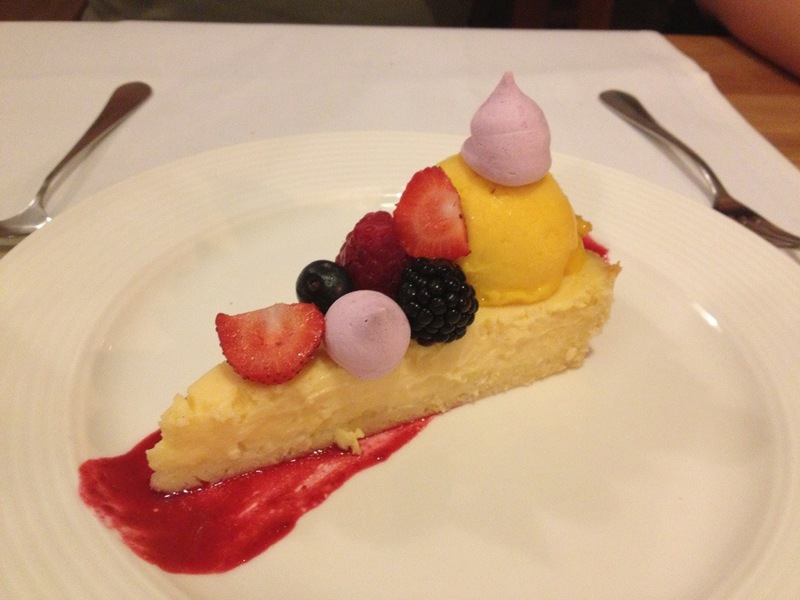 And just to make you jealous, here are pictures of our wonderful food! 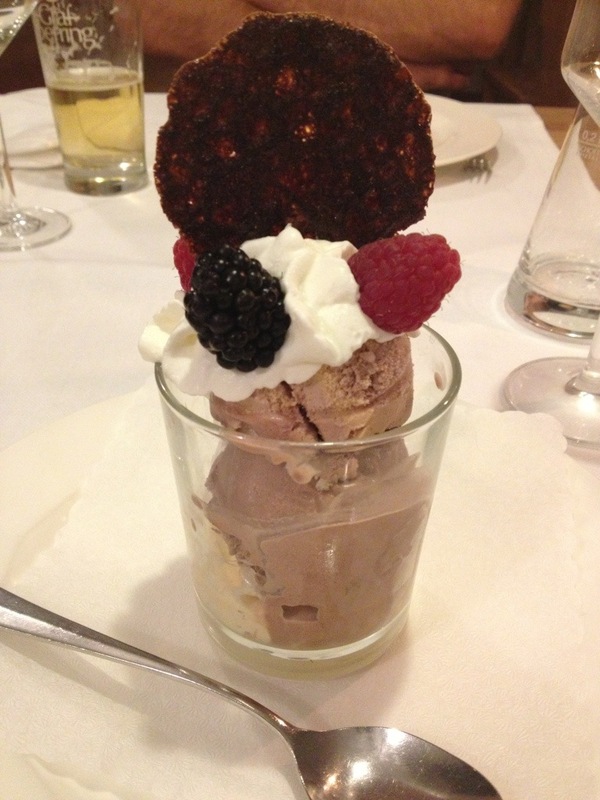 It was a lovely evening with our friends and it was just a shame that we were tired and couldn’t stay up later! 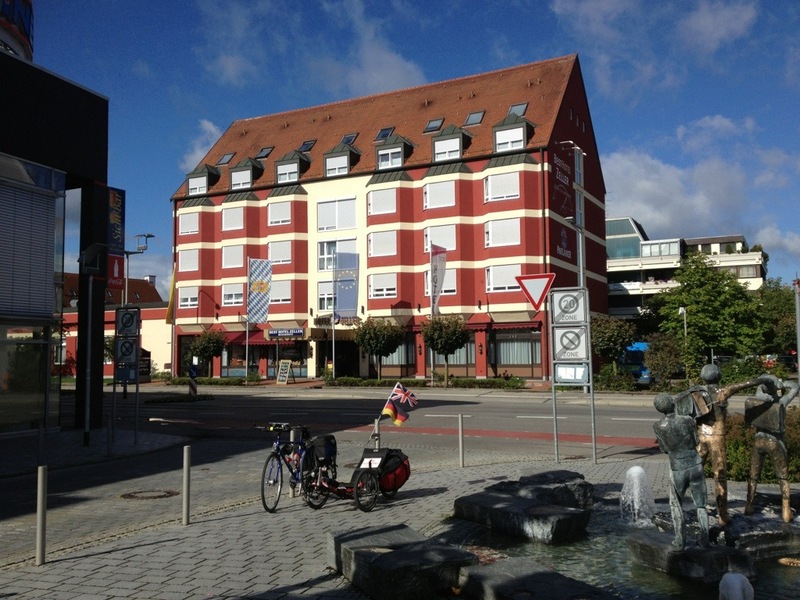 Tomorrow we have a forty mile ride to Harburg but there is a possible shortcut if James is still feeling a bit tired so we can decide on that during the day if necessary. 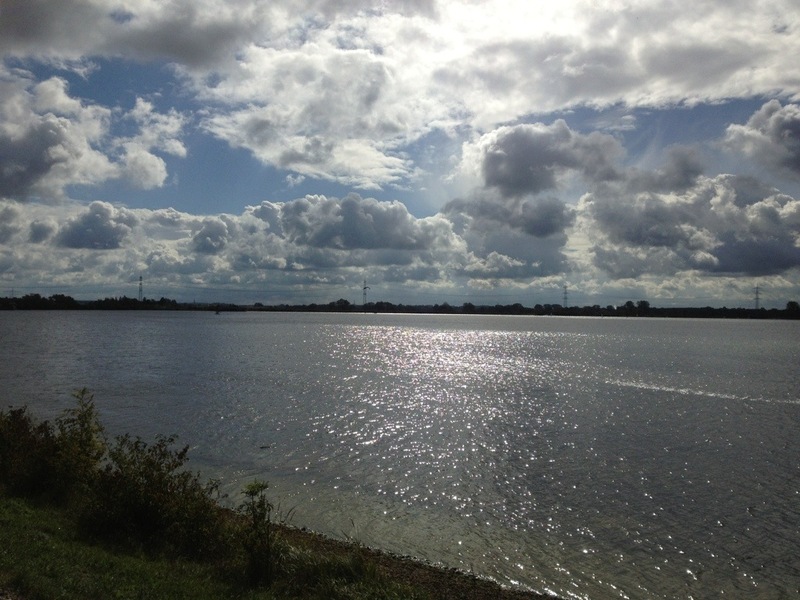 Again, not a single drop of rain landed on us on the bikes today. Tomorrow rain is forecast but we may – just may – be lucky again. Here’s hoping!